Sometimes you just want to pick someone’s brains or confirm your thoughts about what you plan to do in the backyard. If you don’t think you need a full design package, we can visit and conduct an on the spot assessment and leave you with a sketch map or notes for refurbishing or starting afresh in your garden. We can examine existing fruit or berry plantings, recommend the best place for compost, chickens, propagating areas, and give you details of materials and suppliers that we recommend. Visit takes around 1 hour. Our 10 month ‘mentoring’ program in your own garden. 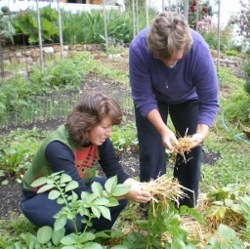 We visit each month and demonstrate / guide you in all aspects of home food gardening. Our curriculum includes understanding soil, fertilising, pest control, watering, compost making, seed saving, garden planning. We provide all annual veg and herb seeds and seedlings, a garden diary and notes, email and phone support. We can provide manure, lime, fertiliser, trellis support and mulches at cost, and bring them to your door, or organise to have them delivered. Starting from scratch? We can help you decide what should go where. We’ll visit your place, assess your site, talk about your vision for your garden and what you like to eat. 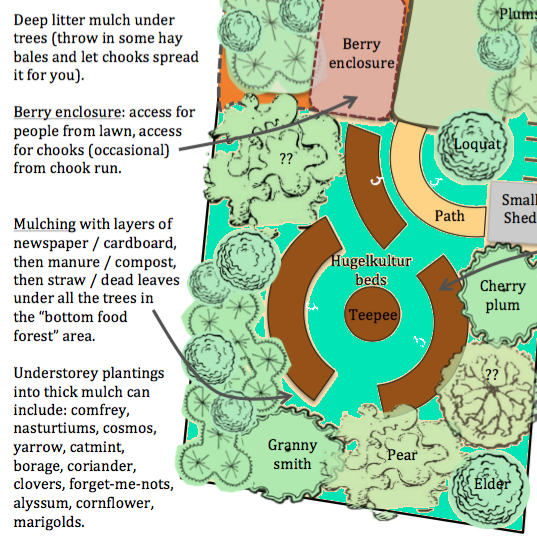 We then create a concept plan showing areas for vegetable and herb beds, fruit, berries and nuts, chickens (if you want them) and composting areas. We develop an establishment plan with quantity and cost of materials needed, and where to get them. We also create a vegie planting plan, factoring in your food preferences, site information, companion planting and crop rotation needs. Contact us to arrange a preliminary chat.